California's Discovery of Gold in 1841. Overland Monthly | Vol. XIX No. 113, Pp. 524-529 | May 1892. U.S. Treasury voucher for gold deposit, 1843. Click to see it in its intended position within the text. During the year 1848 I was a Bank clerk in the city of New York. News came of the discovery of gold in California. The report met with derision from the majority of those who had the handling of the people's gold. Little did I imagine that in the year 1892 I should be counted an old resident of the mighty empire established on this golden foundation: still less that it should be my lot to assist in circulating the fact that the proved date of the first discovery of the precious metal in California was not 1848 but 1841. It may be said, indeed, that the world at large knows no other date for this discovery but 1848, and that multitudes of Californians profess the same knowledge. Nevertheless I shall endeavor to set forth by irrefragable testimony, — the testimony of living, trustworthy Americans, — the truth of my assertion. Added to this testimony will be the official proof of the United States government as to the mint assay of gold sent from California in the year 1842. It is certainly true that gold in quartz was first found in 1848, and by Marshall, to whom the people have justly raised a monument; but it is none the less true that gold in dust was discovered at the earlier period, and that thousands of dollars' worth of the same was then used in trade. There is a temptation for the writer to indulge in romance. The very word gold takes us back to the time of Sir Francis Drake, who reported to the government of Queen Bess, in the year 1578, "A reasonable quantity of gold and silver" to be found in the region of California. Fascinating legends and traditions suggest, but do not absolutely prove, the existence of mining sites long since forgotten. I shall hold to a plain unvarnished tale. A few more introductory words, however, in simple justice to myself. If it is clear that much of the history of the '49ers is wrapped in doubt, and that it is hard to get at the exact truth in all that concerns the military era just preceding theirs, — the era of Stockton and Kearney and Fremont, — how much harder it is to verify the occurrences of a still prior date. The task is not only difficult, and necessarily protracted, but of the most solemn character. There must be interviews with men whose years are far beyond the average life, and letters written to those whose brains may still be vigorous but their hands unable to hold the pen; — letters written, it may be, to those who can never answer on this side of the grave. Walking down Santa Barbara's State street, on a summer afternoon of the past year, and just fifty years, perhaps to a month, after the interesting date 1841, I met Captain H.S. Carnes, an elderly gentleman who came to California with Stevenson's regiment in 1847. He has held various public offices in times past, and is now actively engaged on the Santa Barbara Independent. "Captain," said I, "can you of your own knowledge assure me of the discovery of gold early in the forties?" "Certainly I can, sir," he speedily replied; and then courteously offered to loan me a pamphlet which, he said, would give me all the information needed. The pamphlet will be referred to hereafter. Extending my walk I dropped in to see Mr. Streeter, who, though notably as active a man as any in the whole city, was born in 1811. He has lived in Santa Barbara almost continuously since 1844. Before it was a city, in fact, he was a Justice of the Peace in that district. In full and vigorous possession of his faculties, though eighty years old, Mr. Streeter assured me not only that he knew of this discovery from his own personal recollections, but that he had made three or four gold rings from the metal then and there found. "One of the rings," he said, "I gave to a certain lady," — mentioning her name. She resides in or near the city. "But there," he continued, "is a man who can tell you all you wish to know," and he pointed to a gentleman about his own years, who was sitting quietly on a box in Streeter's shop; and I was introduced to Mr. John C. Kays. Mr. Kays came to California in 1842. He told me that shortly after that period he was in business in Los Angeles; that he traded in dry goods with the miners, mostly Sonorians, for gold dust taken from the San Francisco Cañon; that the dust was traded at eighteen dollars per ounce; that some of that dust was shipped to Boston, and there was worth twenty-two dollars per ounce. To note the gait of Mr. Kays on the streets, one would characterize him as unusually active for his years; and his mental faculties have kept pace. The pamphlet that Captain Carnes handed to me is entitled "An Historical Sketch of Los Angeles County." It was compiled in the centennial year, 1876, by three well-known residents, J.J. Warner, Benjamin Hayes, and J.P. Widney. Mr. Hayes came to Los Angeles in 1850; was at one time city attorney, and afterwards a district judge for eleven years. Colonel Warner came to California in 1831, at the age of twenty-eight. Afterwards, revisiting his native State, (Connecticut,) he delivered a lecture there upon California. The lecture was also given in Rochester, New York, and in the year 1841 portions of the discourse were published in the New York Journal of Commerce. It is interesting to know that he then demonstrated the advantages of building a railroad across the continent. He is the sole writer of that portion of the pamphlet which deals with the gold discovery, and is, I believe, the only survivor of the three compilers. It is upon his evidence that I rely for substantiating the date 1841. There is conclusive evidence that the first known grain of native gold dust was found upon, or near, the San Francisco Ranch, about forty-five miles westerly from Los Angeles city, in the month of June, 1841. * * * The discovery of this gold was, in a two-fold manner, accidental. Some time in the latter part of 1840, or the early part of 1841, a Mexican mineralogist, Don Andres Castillero, traveling from Los Angeles to Monterey, while passing along the road over the Las Virgenes Rancho, saw and gathered up some small water-worn mineralogical pebbles, known by Mexican placer miners as tepustete, — a variety of pyrites, — which he exhibited at the residence of Don José Antonio de la Guerra-y-Noriega, in Santa Barbara, where he was a guest; and stated that wherever these pebbles were found in place it was a good indication of placer gold fields. A Mr. Francisco Lopez, also known by the name of Cuso, a farmer and herdsman, living at the time upon the Piru Rancho, was present and heard the statement, and saw the pebbles. Not long after this incident, Mr. Lopez noticed a pebble similar to the one he had seen in the hands of Mr. Castillero; and remembering what was then said about its being a sign of gold, he scooped up a handful of the earth and, rubbing it in his hand, found a grain of gold. The news of this discovery soon spread among the inhabitants, from Santa Barbara to Los Angeles, and in a few weeks hundreds of people were engaged in washing and winnowing the sands and earth of these gold fields. The writer of this visited the mines within a few weeks of their discovery; and from these mines was obtained the first parcel of California gold dust received at the United States Mint in Philadelphia, which was sent to that mint by the Honorable Abel Stearns, late of Los Angeles city. It was sent with Alfred Robinson, and went in a merchant sailing ship around Cape Horn. A certificate of its deposit in the mint is in the possession of the Society of California Pioneers, in San Francisco. The pamphlet gives letters from Stearns and Robinson. I shall quote in part from that of Mr. Stearns, omitting the circumstantial account of the Lopez discovery, because it is essentially the same as already given. Los Angeles, July 8, 1867. On my arrival here from San Francisco, some days since, I received your letter of June 3d last past, requesting the certificate of assay of gold sent by me to the Mint at Philadelphia in 1842. I find by referring to my old account books that November 22d, 1842, I sent by Alfred Robinson, Esq. (who returned from California to the States by way of Mexico,) twenty ounces California weight (18¾ Mint weight) of placer gold, to be forwarded by him to the U.S. Mint at Philadelphia for assay. In his letter to me, dated August 6th, 1843, you will find a copy from the Mint assay of the gold, which letter I herewith enclose to you to be placed in the archives of the Society. ... While worked, there was some six or eight thousand dollars taken out per annum. New York, August 6th, 1843. "Before melting, 18 34-100 oz. ; after melting, 18 1-100 oz. ; fineness, 926-1000; value, $344.75; deduct expenses sending to Philadelphia and agency there, $4.02; net, $340.73." Reference is made to the public career of the various witnesses, because that very publicity gives all the more opportunity for testing their veracity. The history of the times shows that Mr. Stearns occupied positions of government trust from the year 1836. Once he was a member of the State Legislature, and always a prominent citizen until his death. Mr. Robinson came to California as far back as 1829. He was agent of the Pacific Steamship Co. at one time, and wrote a "Life of Early California." It would seem now as if my investigations should draw to a close; but enquiry about these records of the Society of Pioneers brought me a polite but discouraging answer from Mr. E. Marcellus, the present secretary. He writes that, notwithstanding a thorough search, the letters of Robinson and Stearns and the Mint certificate cannot be found; and that it is supposed they were lost in the moving of the Society's effects to its present quarters. The search has been futile, but the fact remains that I did receive those letters, and that one of them did enclose such certificate. ... I often conversed with Mr. Stearns and Mr. Robinson about the deposit, and the latter informed me he purchased boots and blankets with the $340.73 coin which he got from the Mint. Mr. Stearns is dead. Mr. Robinson is still living here, though nearly ninety years old and totally blind. J.J. Warner is still living in Los Angeles. ... Of one thing you may be assured, the gold was discovered as noticed in Warner's pamphlet; the certificate was in my possession, and was filed in the Pioneer archives. Surely this is most reliable and valuable testimony on the part of Mr. Lull; but he cannot find the important records. I have caused a diligent search, and no record of such a deposit from 1841 to 1844 can be found here. The Assayer's record shows no deposit of gold of the fineness or weight of that you refer to. The memorandum you copy is not of record, but the receipt will be found, if it exists, in the office of the First Comptroller, Washington. Referring to your letter of the 12th inst., relative to the deposit of gold bullion by Grant & Stone, at the U.S. Mint at Philadelphia in 1843, the gross value of which is stated to be $344.75, I have the pleasure to reply that upon investigation and search among the files of this office I find that there was such a deposit of gold by Grant & Stone June 8th, 1843, as evidenced by voucher No. 150 [sic] belonging to the bullion accounts, No. 86,829, of Isaac Roach, Treasurer of the Mint at Philadelphia, a certified copy of which voucher I enclose to you herewith. It will be seen that one of said parcels of gold dust, weighing 18 530-1000 az., amounts to about $344.75, the same is stated in your letter, the ratio being 800-43. The italics are mine. One of said parcels is the identical one ($344.75) mentioned in Robinson's letter as deposited by Grant & Stone. Washington, D.C., Oct. 21, 1891. Pursuant to Section — of the Revised Statutes of the United States, I, L.W. Reid, Acting Register of the Treasury Department, do hereby certify that the annexed is a true copy of Voucher No. 350, filed with Bullion Account of Isaac Roach, late Treasurer U.S. Mint, Philadelphia, Pa. So far I have gained the satisfactory official assurance from our Government of a date as far back as 1843. Mr. H.H. Bancroft makes the date of discovery 1842, and so does Mr. Stearns. In a recent letter from Colonel Warner, which is now presented, he explains how Mr. Stearns could easily have been mistaken. The pamphlet also points out that "Mr. Stearns, writing upon the subject after a lapse of twenty-five years, and a merchant at that time, would, upon referring to his books, be more likely to find the date of the purchase of gold than that of the discovery of the gold fields." In dealing with these matters Mr. Bancroft is a recorder of what he has read and heard; while Colonel Warner was a prominent actor in the scenes he describes, and an actor, too, of the ripe age of thirty-eight, and with ten years' previous knowledge of California. Now nearly ninety years old, he is described by a neighbor as "a walking cyclopedia of the events of Southern California." It gives me great pleasure to impart such knowledge as I may have acquired to others who may have been less fortunate than myself. I arrived in Monterey, from a visit to New England, in June, 1841. I reached home in Los Angeles July 4th. I came from Monterey to Santa Barbara in a schooner belonging to John C. Jones, Esq. There may be some one in Santa Barbara who can remember the arrival of Mr. Jones in his schooner, (as he was then a resident of Santa Barbara, and came in his vessel from Panama via Monterey,) who may also remember the discovery of gold by the herdsman of Captain Noriega, and can tell which of these two events first occurred. I remained in Santa Barbara at that time two days, one of which was the first day of July. I cannot now say with certainty, but I do firmly believe that when in Santa Barbara at that time the discovery of gold by Noriega's servants was a subject of general conversation. Not long after my return home, I accompanied three or four men to the gold fields on the ranch of San Francisco, then owned by Antonio Del Valle. The men with whom I went were not residents, but visitors in Los Angeles, being owners, supercargoes, clerks, etc., of merchant vessels then trading on this coast. I do not remember (and have no notes to which I can refer) the month in which this visit was made. It was in the summer, or dry season, of the year. Only a small quantity of gold had at this time been obtained from the diggings, and still less, — I may say samples only, — had been brought into Los Angeles. There were not, at the time, more than twenty, and perhaps not exceeding fifteen, men on the gold fields. Water was very scarce, and washing proceeded slowly. The quantity of gold in the pan of earth was small, and no rich strikes had been made. The number of men engaged in gold mining did not increase, but I think diminished, until after the commencement of the rainy season, when, as water was more abundant, a much larger number of men engaged in the business; and during the winter and spring following the discovery a good deal of gold was obtained and brought to Los Angeles, or carried to Santa Barbara. When Judge Hayes, Dr. Widney and myself were appointed by the authorities of this county to prepare the Historical Sketch which had been requested by the United States Commission for the Celebration of the American Centennial, we engaged in the task uninfluenced by any other motive than that of furnishing a brief but reliable account of such historical facts as were within our knowledge, or could be obtained from indisputable records or other conclusive evidence. It was not generally known throughout the United States that gold had been discovered and obtained in considerable quantities from the earth in California prior to the great Marshall discovery. In compiling the Historical Sketch, the authors, knowing that the first discovery of gold was made within the county of Los Angeles, thought it a matter of too great historical importance to be omitted; and also knowing that the late Abel Stearns had sent some of this Los Angeles gold to the United States Mint, inquiry was made of his family respecting the matter; but no definite information could be obtained, except that the Mint certificate had been transferred to the California Society of Pioneers. Application was then made to the Secretary of that Society, the result of which is to be found in the Sketch. Mr. Bancroft asserts that the discovery of gold was made in 1842, and cites events and transactions to sustain the assertion; but the careful reader will observe that no one of the events he cites has any bearing upon, or connection with, the date of the discovery. Alcaldes could not have been appointed on that day, nor could they have been appointed until such officers were required for the preservation of peace and administration of justice among the miners; and as there were no miners, or at least not in sufficient numbers as to require the presence of Judicial officers, no appointments were made until about the end of the rainy season (March), when a good many people commenced work in the gold field. Neither the discoverers nor the prospectors who examined the country required, or had, any judicial officers to guide or control them. In another place Mr. Bancroft says that the gold was discovered on the ranch of Antonio Del Valle during his lifetime. There is also, in one of his volumes, a biography of Mr. Del Valle, (probably furnished by his son, Don Ignacio Del Valle,) in which it is stated that Mr. Del Valle died in 1841. 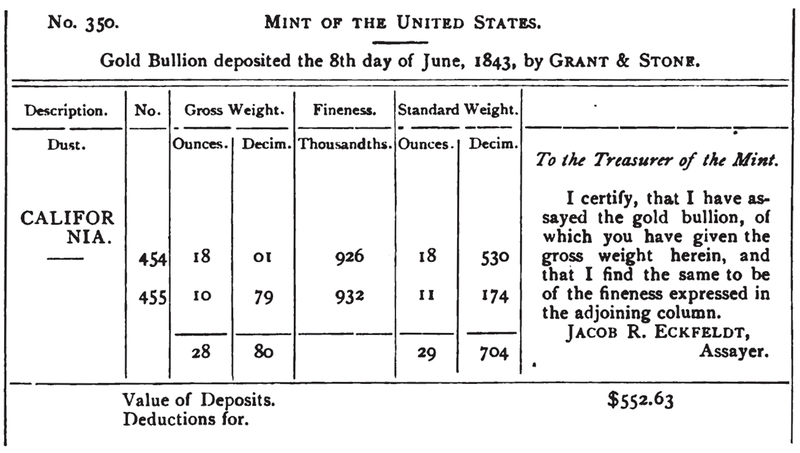 Mr. Stearns could not have bought gold upon the day of the discovery, nor until the gold was mined and taken to market; and this might, or might not, have been until the lapse of one or more years from the time of discovery: so his purchases of gold, whether made in March, or some other month, have no weight in fixing the date of discovery. Considering the object for which the Historical Sketch was written, — that it was to form a part of that great historic volume of the United States down to the close of the first century of the existence of the American Government, and to be preserved through coming centuries as long as the American nation should exist, the writers, without expecting or receiving any fee or reward, sought to include in it only such statements for the correctness of which they had conclusive evidence. You have my consent, and are at full liberty to make such use of this letter as you may deem proper. Having the above consent, I have published only such portions of the letter as, to my mind, are essential to the chain of proof. It seems almost useless to comment upon such a document, so full of intrinsic merit, evident truth and patriotic fervor. The orderly sequence of the narrative, however, is in the writer's favor, and invites notice. He arrived at Monterey in "June, 1841," on his way to his home in Los Angeles. He stops at Santa Barbara, as he sails along the coast, remaining in that pueblo "two days, one of which was the first day of July." He reaches Los Angeles on July 4th. "Not long after my return home," he writes, and that wording is significant as showing that it was still 1841, he "accompanied three or four men to the gold field." "It was in the summer or dry season of the year." This wording is also significant, for in California the dry season is always in the summer, and the wet season does not come until the winter months. Thus the date of the discovery is established as being 1841. The very limited circulation of the fact, even in the State itself, is warrant for this article. It gives me pleasure to have the opportunity of sending Colonel Warner's letter and the official copy of the Mint certificate to the Society of California Pioneers, for deposit among the archives.